Attired in their Russian launch and entry suits, space tourist Guy Laliberte (left), Russian cosmonaut Maxim Suraev, and NASA astronaut Jeffrey Williams, take a break from training in Star City, Russia to pose for a portrait. A Canadian space tourist and two career astronauts are enroute to the International Space Station (ISS). The trio is due to dock at the orbital outpost at 4:37 a.m.EDT (0837 GMT), where paying passenger GuyLaliberte - founder of circus troupe Cirque du Soleil - will spend about 10days. His two crewmates, NASA astronaut Jeffrey Williams and Russian cosmonaut MaximSuraev, are set to join the station crew for a six-month stay. Laliberte, Williams and Suraev blastedoff on their Russian-built Soyuz TMA-16 spacecraft Wednesday from the CentralAsian spaceport of Baikonur Cosmodrome in Kazakhstan. "The Soyuz is very small - it's as if you're tripletsin a womb," Williams said Tuesday before liftoff. After arriving, crews on both the Soyuz and the spacestation will work to seal the link between their vehicles before opening thehatches at about 7:40 a.m. EDT (1140 GMT). 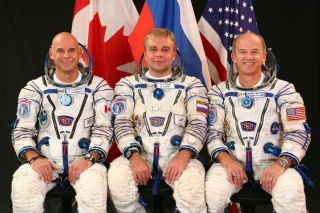 The new arrivals will be met bycurrent station commander Gennady Padalka, a cosmonaut, along with Belgianastronaut Frank De Winne, Canadian Space Agency astronaut Robert Thirsk,Russian cosmonaut Roman Romanenko, and NASA astronauts Nicole Stott and MichaelBarratt. The Soyuz-TMA-16's arrival Wednesday will mark the firsttime three Soyuz spacecraft have been simultaneously docked at the orbitinglaboratory. Laliberte plans to spend his time in space publicizing waterconservation issues. In addition to his career as an acrobat, Laliberte is thefounder of ONE DROP, a non-profit organization dedicated to fighting worldpoverty through working to provide global access to clean water. The highlightof his space voyage will be an Oct.9 performance, where Laliberte will recite a poetic story about water, withhelp from artists and personalities webcasting along with him from 14 citiesaround the world. "When I founded ONE DROP, it was (or rather, it stillis) desperately urgent to do something to protect water," Laliberte wrotebefore launch on his blog at OneDrop.org. "ONE DROP is already acting inpractical terms, but in the project of going into space, I saw an innovativeopportunity, reflecting the image of Cirquedu Soleil and my own image, too." Laliberte hopes the event, which will include appearances byAl Gore, Shakira, U2, Peter Gabriel and more, will spread the word about waterin a creative way. It is also the first big artistic event to be performed livefrom space. Laliberte's spaceflight, which he calls the "PoeticSocial Mission," isn't purely altruistic. "Of course, it is thanks to my own financial situationthat I have been able to experience such an adventure," he wrote. "And yes, I am also making a personal dream come true through thismission." The project won't leave too much time for goofing around,but Laliberte said he plans to squeeze in some fun, including tickle-fests withhis crewmates and passing out a red clown nose to everyone onboard to wear. "I?m very excited about this journey I?m undertakingand everyone I?m meeting through it," he wrote. "This is both apersonal challenge, as everything I?m experiencing here is new to me, and agrand project that will benefit my ONE DROP Foundation as well as Cirque duSoleil." Soon after Williamsand Suraev arrive on the space station they will take part in a transitionceremony to mark the beginning of the ISS Expedition 21 mission. It will be thesecond station increment with a six-person crew, doubled from the previous crewcomplement of three. "Now we?re a much bigger team with six on board,"Williams said in a preflight interview. "I?m looking forward to thechallenge of six-crew operations." Williams has been to the space station twice on previousmissions. The orbiting laboratory will be about the double the size it was thelast time he saw it, he said, and is now almost completely assembled. "It?s not over when we complete it," Williamssaid. "When we complete it, we need to utilize it. My hope is that we getthe full utilization out of this magnificent technical accomplishment." Indeed, the Expedition 21 crew plans a challenging fullslate of scientific research to take advantage of the orbiting lab facilities. During the busy mission, the resident spaceflyers will hosttwo visiting space shuttle missions, one more Soyuz flight, and a handful ofunmanned cargo craft arrivals. Among the new supplies and equipment to bedelivered on these flights is a new node module named Tranquility, which willinclude a panoramic window called the Cupola. The Soyuz-TMA-16's arrival Wednesday will mark the firsttime three Soyuz spacecraft have been simultaneously docked at the ISS. The expedition will also include a spacewalk, orextravehicular activity (EVA) in NASA parlance, in which rookie flyer Suraevwill take part. "I do have just one EVA during my mission," hesaid in a preflight interview. "On the personal side, I?m really lookingforward to the EVA. And as a professional, I really want to not make mistakesduring my flight." Guy Laliberte is chronicling his Poetic Social Mission usingTwitter ("ONEDROPdotorg"), Facebook and the Web site: OneDrop.org. SPACE.com is providing full coverage of the launch ofLaliberte and the Expedition 21 crew with Staff Writer Clara Moskowitz in NewYork. Click here for mission updatesand live mission coverage.